Home » Health » What Is Measles? Signs such as a cold (eg sore throat, runny nose, or nasal congestion). Grayish gray spots on the mouth and throat. Spots or red-brown rash will appear on the skin after a few days later. The order of occurrence of these spots from behind the ears, around the head, then to the neck. In the end the rash will spread throughout the body. In addition, patients also have the potential to experience swelling of the lymph nodes in the neck. You should contact your doctor, clinic, or the nearest hospital if you suspect you or your child has measles. Diagnosis of measles can be done by looking at the symptoms that appear. But to confirm the diagnosis of measles, saliva and blood samples were taken for the test. 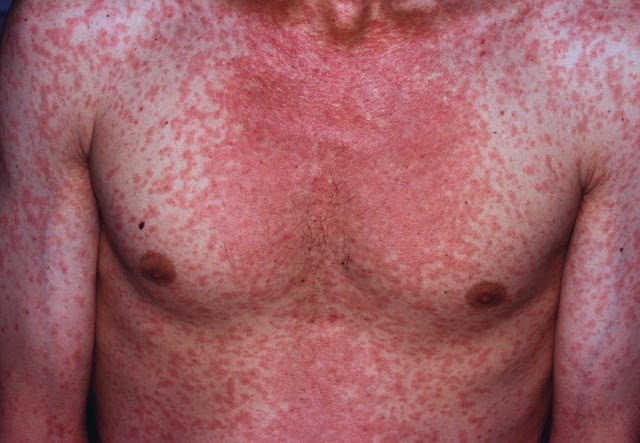 This disease is also called rubeola or red measles. Vaccines are available to prevent this disease. The vaccine for measles is included in part of the MMR vaccine (measles, mumps, German measles). For people with measles, measles virus is present in the sparks of fluid released when they sneeze and cough. Measles virus will infect anyone who inhale sparks of this fluid. Measles virus can survive on the surface for several hours and can survive stick to other objects. When we touch an object that has been splashed by measles virus and then put a hand to the nose or mouth, we can get infected. Measles is more common in toddlers. But basically everyone can get infected with this virus, especially those who have not been exposed to measles or who have not received measles vaccination. The human immune system will naturally fight this viral infection. But if complications occur or measles infections become so severe, hospitalization is likely to be needed. Many breaks and avoid sunlight as long as the eyes are still sensitive to light. Drink fever-lowering medication and pain reliever. Do not give aspirin if your child is less than 16 years old. Complications of measles can be very dangerous. Although the number of people with measles complications is quite small, the disease must remain alert. Examples of complications are inflammation of the ear, bronchitis, lung infections (pneumonia), and brain infections (encephalitis). The baby is under one year old. Children with poor health conditions. People with weak immune systems. MMR vaccination is a joint vaccine for German measles, mumps and measles. MMR vaccination is given twice. The first is given when the child is 13 months old, then the next is given when they are aged 5-6 years or before entering elementary school. Eyes red, swollen, and sensitive to light. Signs resembling a cold (eg sore throat, dry cough, and runny nose). Small, grayish white patches in the mouth and throat. Do not get excited and lose your appetite. Measles rashes appear no later than four days after the first symptoms appear, and last about seven days. It will initially appear from behind the ear, then spread to the head and neck, until finally to the whole body. The small-sized patches will swell rapidly, until eventually it fuses. You should contact your doctor, clinic, or the nearest hospital if you suspect your child has measles. Diagnosis of measles usually can be enforced by a doctor just by looking at the characteristics of spots or rashes that are in the mouth and based on the explanation of the symptoms you are experiencing. However, in some cases, your doctor may advise you to perform a simple blood test as well as examination of viral cultures from saliva to confirm the diagnosis. However, these two tests are rarely performed unless you show less obvious symptoms. The human immune system will naturally fight against measles virus infection. There is no specific medicine for treating measles. The condition of the patient will usually improve without special treatment within one to two weeks. Give plenty of drinking water to the child to avoid dehydration. Water consumption can also relieve a sore throat due to cough. Remember that when the body is in fever, the need for fluids increases. Generally for adults who experience fever and pain, consumption of paracetamol or ibuprofen can be done. You can also give paracetamol in liquid form for your child. Drugs like Vitamin A and antibiotics may be prescribed by a doctor once symptoms appear. In addition, measles vaccination options are also available. For example a measles prevention shot that can be given 72 hours after symptoms appear or injection of immune globulin serum for infants or pregnant women after 6 days of exposure to the virus. Talk with your doctor to find out the right treatment for you or your child. Use a water-soaked cotton cloth to clean eye droppings during measles infections. Eye of measles sufferers will become more sensitive to light. To overcome this, close the window with a curtain or replace the dimmer light at night. There are likely to appear similar symptoms such as runny nose like a runny nose or cough. You can consume hot drinks to relieve these symptoms. In addition, you can do inhalation therapy of steam. For a small child, you can bathe with warm water. Warm drinks containing lemon and honey can be given to small children. Keep in mind that giving honey is not recommended for children under one year. Decreased awareness, marked by one by constantly feeling sleepy. Symptoms of dehydration, such as dry mouth or reduced frequency of urination. Pain in the chest, especially when breathing. Call or come directly to the nearest hospital if you or a family member has any of the above symptoms. Although rare, measles can lead to serious complications. Infants and children with malnutrition are the most vulnerable to catching measles. In addition to those, the immune people are low (eg AIDS sufferers, cancer patients undergoing chemotherapy, or chronic disease sufferers) and pregnant women are also vulnerable to contracting. Respiratory and lung infections (eg pneumonia and bronchitis). Inflammation of the vocal cords. Meningitis (inflammation of the lining of the brain and spinal cord). Eyes squint due to the effect of the virus on the nerves and muscles of the eye. Problems with the nervous system and heart. Optic neuritis or inflammation of the eye nerve that can cause permanent blindness. Thrombocytopenia or decreased platelet counts that are functioning to freeze blood. Pregnancy problems (eg miscarriage, premature infants, or low-birth weight babies). Children aged over 1 year with healthy body condition rarely have complications. The best way to prevent measles is by immunization since childhood. There are two choices of measles vaccination. The first is the measles vaccine that the government enters into the compulsory immunization program. This vaccine is given at the age of 9 months, 2 years, and 6 years. The second type of vaccine is the MMR, which is a joint vaccine for measles, mumps and German measles. This vaccine is given at the age of 12-13 months and at age 3-5 years. A newborn will have antibodies against measles if the mother has had measles or has received measles vaccinations before becoming pregnant. These antibodies will provide protection for the first few months. Therefore, a special measles or MMR vaccine should be given when a baby is over half a year old. These two types of measles vaccination are not recommended for pregnant women who are not protected from measles. But for women who want to get pregnant and have not been exposed to measles, he can be vaccinated against measles. See a doctor for more information about measles and its impact on pregnant women. Measles is very contagious. If you have measles, avoid the crowded center at least four days after the appearance of the measles rash for the first time. This is important to prevent infections from spreading to others. Avoid direct contact with people susceptible to viral infections such as toddlers, young children, and pregnant women. 0 Response to "What Is Measles?"